A client receives a contraceptive implant in Ouagadougou, Burkina Faso. Photo by Trevor Snapp for IntraHealth International. 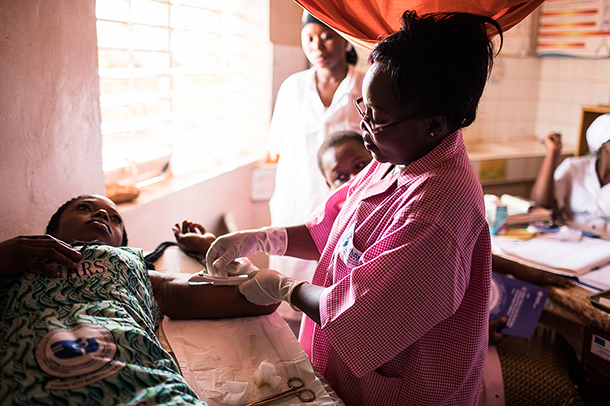 In 2017, the nine countries of the Ouagadougou Partnership together prevented 100,000 unintended pregnancies, 32,000 unsafe abortions, and 400 maternal deaths in francophone West Africa by bringing modern contraceptives to over 383,000 new users. In two years, the partnership has reached 41% of its goal of an additional 2.2 million women in the region using contraceptives by 2020. Burkina Faso and Cote d’Ivoire are leading the way, reporting last month at the partnership’s annual meeting in Conakry, Guinea, that they added 73,000 and 88,000 women respectively in 2017, surpassing their expected contributions. West Africa has suffered historically from persistently low contraceptive prevalence rates, largely due to socio-cultural barriers, weak health systems, limited political will, and a lack of resources. The Ouagadougou Partnership formed in Ouagadougou, Burkina Faso, in February 2011 among the governments of nine francophone West African countries, their technical partners, and donors to accelerate the use of family planning services in the region. The countries include Benin, Burkina Faso, Côte d’Ivoire, Guinea, Mali, Mauritania, Niger, Senegal, and Togo. We are all driven by the same ideals and aspirations, those of: reducing maternal mortality, promoting the development of women and girls, guaranteeing the success of our youth, and contributing to the economic emergence of our countries. And many countries are making big gains. The modern contraceptive prevalence rate (mCPR) among married women in Burkina Faso has risen from 17.5% in 2012 to 27.3% in 2017. In Cote d’Ivoire, it’s increased from 13.1% to 20.9%, and in Togo from 16.8% to 25.9%. But the region still as has far to go. The United Nations estimates the region’s mCPR among married women is 20% compared to 43% in East Africa and 63% worldwide. The partnership is designed to improve coordination among donors and partners, optimize resources, and provide more opportunities for countries to learn from each other’s efforts. In 2015, the partnership surpassed its initial goal of reaching one million additional women with modern contraceptives and announced its current, ambitious goal for 2020. IntraHealth International hosts the Ouagadougou Partnership Coordination Unit (OPCU) in Dakar, Senegal. The OPCU is jointly funded by the William and Flora Hewlett Foundation and the Bill & Melinda Gates Foundation. Key donor members of the Ouagadougou Partnership include Agence Française de Développement (AFD), French Ministry of Foreign Affairs, Bill & Melinda Gates Foundation, William and Flora Hewlett Foundation, US Agency for International Development (USAID), United Nations Population Fund (UNFPA), Dutch Ministry of Foreign Trade and Development Cooperation, and Canadian International Development Agency.